IBM recently released an executive report titled Making Change Work … While the Work Keeps Changing (How change architects lead and manage organizational change). The report, which is based on data from their latest Making Change Work study seems a very pertinent one for the times. As a whole, we know that this is a period of significant change for the workforce. We talk about these changes, and how they can and are affecting organizations, but there is significantly less talk around how organizations are successfully managing such change – which is exactly what IBM’s report dives into. IBM’s data is based on survey results from almost 1,400 individuals responsible for designing, creating or implementing change across their respective organizations. 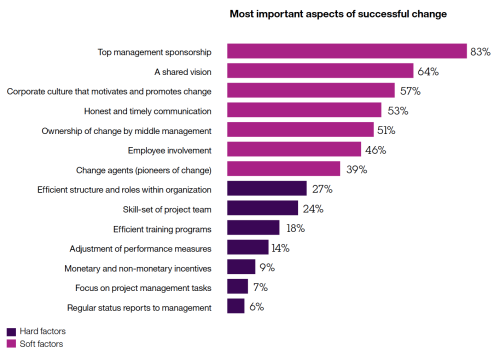 In IBM’s study, they consider only the top 20 percent of organizations to be highly successful when it comes to change management. These “Change Architects” are organizations that indicated at least 75 percent of their projects were a complete success (i.e. a minimum of three-in-four projects met all predefined goals). Change Architects capitalize on, as IBM puts it, “the vortex of change permeating every aspect of business.” Such organizations are considerably more successful at managing projects. 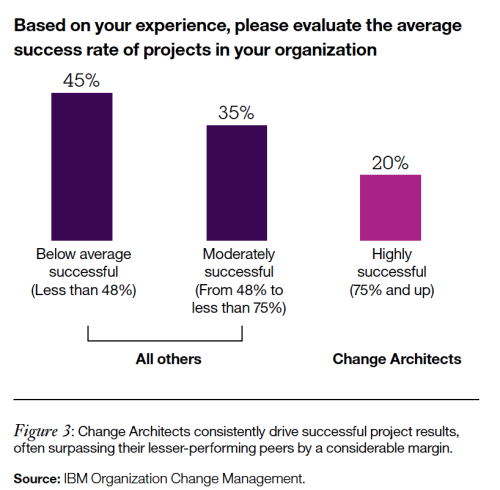 Compared to the average in IBM’s survey, Change Architects have at least 56 percent more projects that were a complete success. When it comes to managing change, organizations must lead at all levels. Many organizations fail to successfully manage change because they have do not embrace a “change-centric” culture, despite, as IBM points out, that change is the one constant that organizations will always face. Despite this fact, only 66 percent of respondents state that their top management is enabled to act as change leaders (for Change Architects, this jumps to 77 percent). Role modeling throughout the organization. Engaging employees with a compelling case for change. Empowering new and passionate change leaders at all organizational levels. Another critical responsibility of top management in regards to effectively managing change is making change matter. Managers must make sure that if change management programs exist, employees thoroughly understand the activities and benefits of those programs. 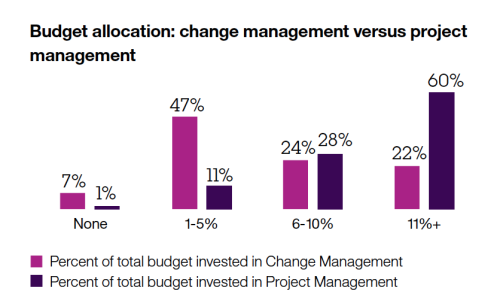 Respondents report that when change management activities are incorporated into the overall project plans from the beginning, successful project results are more likely. 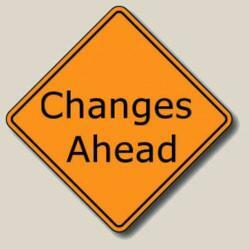 What then, is preventing change management activities? Change management is too expensive (26 percent). Some 60 percent of the organizations in IBM’s study confirm a formal career path for project managers. This is opposed to only 25 percent for change professionals. Change Architects often establish a formal career path for change professionals (42 percent more than other organizations). They use this formalized change discipline for central change coordination; to drive consistent methods, change-related trainings, career developments, asset reuse, company-wide knowledge and best practice sharing. While organizations that we can truly call “Change Architects” may still be few are far between, the good news is that between 2008 and 2014, the use of formal change management methods increased significantly. This indicates that awareness for this organizational management need is, at the very least, rising on companies’ radars. Managing change is tough, as we all know. This report suggests that making change management a core competence in our organizations may just make our change experiences more successful in every way. Building and exercising change management muscles may make all the difference!